This area of Scotland includes the Highlands, Orkney Islands, Shetland and Western Isles. To the north-west of Stirling lie the magnificent mountains and glens that form the gateway to the Highlands. Most of the iconic photographs of Scotland, such as romantic loch-side castles, tartan, kilts, bagpipes, whisky and craggy mountain vistas originate from the Scottish Highlands. Whilst these images enrich the popular picture of Scotland as a whole, for many centuries the local cattle-raising Celtic clans had little in common with their southern neighbours. It was not until the arrival or the West Highland Railway, in the late 19th century, that the Highlands really opened up. 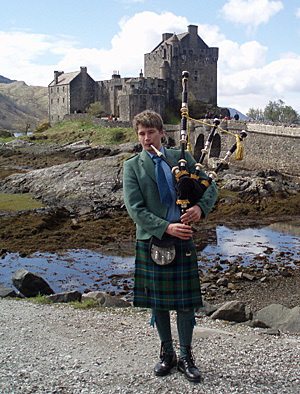 Highlands: Fort William, Invergarry, Inverness, Isle of Skye, John o'Groats . Orkney Islands: Kirkwall, Sromness . Shetland Islands: Baltasound, Lerwick, Scalloway .